CORVALLIS, Ore. – The Open Source Lab in the College of Engineering at Oregon State University has significantly upgraded the FTP service used by the open source software community and increased its download speeds by 900 percent. This service can now handle millions of additional download requests per day, and serves as a critical link in the distribution of open-source software around the world. With recent improvements, the lab increased the combined download speed to 30 gigabytes per second, and storage capacity to 9 terabytes, a 50 percent increase over what was previously available. Other performance improvements include a 100 percent increase in peak hard disk throughput, and a 60 percent increased capacity in web traffic. 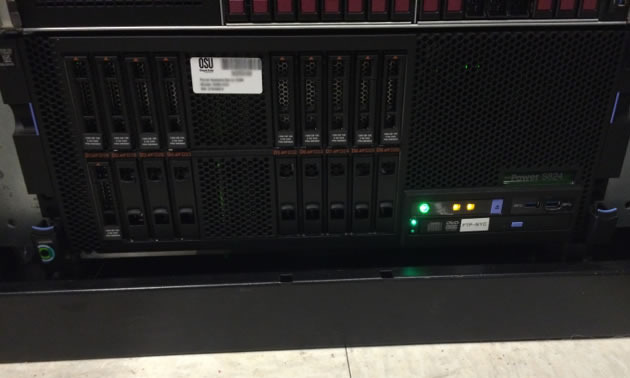 IBM donated three servers with POWER8 architecture for the OSL upgrade. Pictured here is the one located in New York. This cluster, which has locations in New York City, Chicago and Corvallis, Ore., hosts 85 open source software projects, whose users rely on this service to download applications and patches. The content is mirrored to three servers so that it provides the fastest and most reliable service possible. Users include system administrators from around the world keeping Linux servers up to date, and end-users downloading the latest version of applications such as LibreOffice or Inkscape. In the coming months, the lab plans to open up the service to more projects. IBM donated the three new servers that made the recent upgrade possible. Additional industry partners for the project included TDS Telecom and Google. In addition to providing open-source services to the community, the OSL provides Oregon State students with hands-on training in open source development. For more technical details about the upgrade, see Lance Albertson’s blog Leveling Up With POWER8.